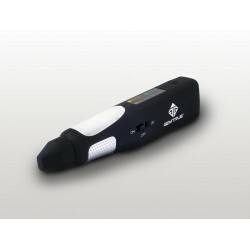 The GemTrue™ Multi Plus is one of the smallest multi testers available. The GemTrue™ Multi Tester uses advanced thermal electrical conductivity to test for diamond, Moissanite (a manmade stone) which has the same thermal conductivity as diamond and registers as diamond on diamond testers, therefore using this Multi Tester helps you to accurately distinguish between Diamond and Moissanite. The tester will also detect semi-precious stones such as rubies, safaris, etc. and show other stone for these types of stones. Battery not included.